We are an Aluminium Chequer Plate Supplier, based in the UK. It is commonly known in the metals trade as Aluminium 5 Bar Treadplate: this is due to its uniform arrangement of groups of 5 raised lozenges, with each group of 5 being set at 90 degrees to each adjacent set. The 5 bar lozenges are raised from the base of the sheet producing a textured and 3 dimensional pattern. Although 5 Bar Aluminium Treadplate is its official name, often it is referred to by one of several other names, such as Aluminium Chequer Plate, Aluminium Floor Plate, Aluminium Durbar Plate, Aluminium Diamond Plate or Aluminium Kick Plate. Whatever you prefer to call you Aluminium Chequer Plates – we have them on the shelf, ready to be cut to size and despatched! 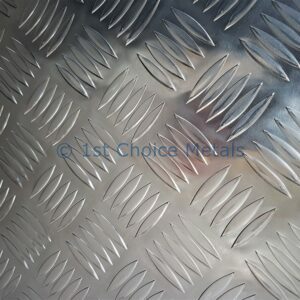 All thicknesses of Aluminium Checker Plates are generally stocked in 2 sheet sizes – 2000mm x 1000mm & 2500mm x 1250mm. We then cut these down to size to meet our customers’ needs. Our Free Aluminium Chequer Plate Cutting Service is quick and simple to use; simply add to basket the nearest sized sheet from the drop down menu, and then follow the on screen instructions to request it cut down to your required sizes. Some thicknesses of Aluminium 5 Bar Treadplate are also available in a 3000mm x 1500mm sheet size – please contact us for further information and pricing. All of our Aluminium Chequer Plate is stocked in grade 5754 H22. Grade 5754 is both harder and stronger than 1050H14, which is the standard grade of Aluminium Plain Sheet. Despite this, Aluminium 5 Bar Treadplate still has great workability and formability and is designed for cutting, shaping & folding. Should you require your Aluminium Chequer Plate folded or welded then please contact us for a quote. 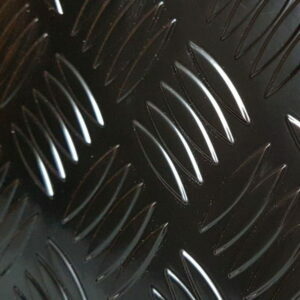 Aluminium Chequer Plate also has excellent weldability, making it a great choice for general fabrications. As with all aluminium, Chequer Plate has excellent corrosion resistance, making it ideal for outdoor use as it will not rust. One big added bonus of the Metal Chequer Plate being manufactured in Grade 5754 is that it also has excellent resistance to saltwater & seawater – essentially it is a marine grade which makes it perfect for boat building, modifications to boats and also for other applications on buildings and fairground rides that reside on the many leisure piers that are dotted around our coastline. As the 5 Bar Chequered pattern stands proud of the base plate, this helps with grip, meaning the plate has, to a certain degree, an anti-slip surface. The 5 Bar pattern also helps make the plate hard wearing & durable. Because of these properties, you will often see Aluminium Chequer Plate used as Vehicle ramps, on commercial vehicle bodies – such as car transporters, on walkways, platforms, stair treads, flooring and on mezzanine floors. Another advantage of Aluminium Chequer plate is that although it has an industrial look to it, at the same time it is also very pleasing to the eye. This combination means is it regularly used on applications such as trade counters, exhibition stands, wall and door coverings in places such as Gym’s, Supermarkets, cash & carries, on fairground and amusement rides, inside bars and nightclubs and also in horse boxes. Should you require a small cut piece of aluminium treadplate for a repair on a boat, or several large sheets of chequer plate to complete the build of a trailer – we can help!